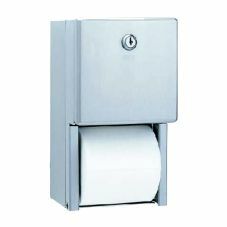 Surface-mounted multi-roll toilet tissue dispenser shall be constructed of type-304 stainless steel with satin finish and all-welded construction. Front of toilet tissue dispenser shall be 22-gauge, drawn, one-piece, seamless construction; and shall be equipped with a tumbler lock. Unit shall dispense two 5 1/4 inch diameter (1800 sheets) toilet tissue rolls. Roll held in reserve shall automatically drop into place after bottom roll is depleted. Dispensing mechanism shall be constructed of 16-gauge plated steel with all-welded construction. Unit shall be equipped with theft-resistant, one-piece, molded polyethylene spindles with minimum 1/8 inch wall thickness.